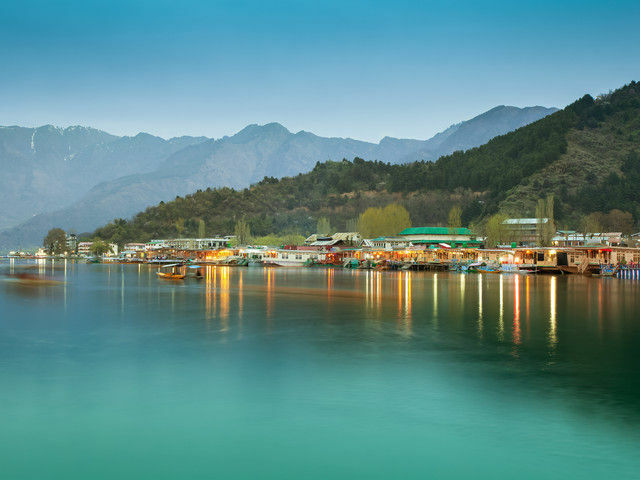 Kashmir is one of several places that have been called the "Venice of the East" or the "Kashmiri Venice Lakes around the city include Dal Lake – noted for its houseboats and Nigeen Lake. Apart from Dal lake and Nigeen lake city is also famous for wular lake Anchar Lake and manasbal lake to the north of Srinagar. Wular lake is one of the largest fresh water lakes in Asia. These Lake maintained by Lakes and waterways development agency Srinagar. The Dal Lake is the most celebrated and important lake among all in Srinagar and its famous all over the world. It is home to carved wooden houseboats, vibrant shikaras and floating gardens. The backdrop to this sixteen kilometer long lake is the Pir Panjal mountain range, adding to the magnificence of this picture postcard vista and you can also visit swimming boat, Water ski, snow skiing (when the lake is frozen during winters), and canoing are some popular water sports practiced on the lake. Don’t forget to travel here early morning to see Srinagar’s famous floating market. Srinagar's Dal Lake is famous the world over for its scenic location, for its Shikaras (boats) that float on it and for the promotion of aqua sports like water skiing. The Dal Lake is also famous for its 'floating vegetable market', the only one of its kind in India and only the second in the world, the other being the rowing shops along the backwaters of the Mekong Delta in Vietnam. It is also a unique Handicrafts market based in center of lake many peoples called it Floating Market. Around 10,000 kanals (around 1,250 acres) of land along the Dal Lake is being used for the cultivation of vegetables, "This is a very old market where the sale and the purchase of vegetables take place between 5 am.and to 7 am. everyday. Most of the vegetables are grown on the lakeside and retrieved from the lake before being sold in just 2 hours. Any vegetables left over are taken to street markets. This market is famous. Many tourists come here just to take photographs of it. Dal Lake is home to vast stretches of lotus plant. Lotus flowers not only balance the wetland ecosystem, but also lend a special kind of beauty to the lake. Nagin lake is very famous among tourist after Dal lake. Nagin Lake is a beautiful water body, known for its sparkling waters and picturesque surroundings. It is nestled in the foothills of the Zabarwan ranges and is bordered by the lofty Hari Parbat and Shankaracharya Hill. Nagin lake is using by International tourist for there staying because its quiet and calm compare to Dal lake. This lake attributes its name to the trees that surround it and earns the sobriquet 'Jewel in the Ring'. The deep blue surface of this lake shimmers with the touch of sun rays that forms a mesmerizing vista. Visitors coming to this lake can take a refreshing dip here as it is considered safe for swimming. Provisions for water skiing and fiberglass boat riding are also present at the site. The most enthralling activity that visitors can enjoy is a ride in the traditional boats called shikaras. In terms of weather, an ideal time to take a tour of this lake is between June and August. You can also enjoy water skiing, fiberglass boat riding and swimming. The most enthralling activity that visitors can enjoy is a ride in the traditional boats called shikaras. Anchar Lake, one of the freshwater lakes of Srinagar, is on a verge of extinction. The depth of the lake is around 3 m but the navigation in the lake is much more difficult as it is infested with weeds. The water of the lake is mainly alkaline and the lake in itself is shallow. Bounded by beautiful surroundings and mountains, the lake is an ideal place among nature lovers and bird watchers. Further, the beauty of the lake can be enjoyed with the help of Mughal style Shikara, which is easily available at the lake side. During winter season, tourists can spot water birds including mallard, pochard, gadwall snipe and teal at the lake side. Just 5 km away from Srinagar city Khushal Sar is within Shehri Khas between Hawal and Zadibal .It is demarcated from Gill Sar (another ailing water body) near Gill Kadal. Once Khushal Sar stretched up to Zoonimar, Aali Masjid and was linked up with Anchar Lake. The name of the lake itself refers to most healthy, prismatic, glittering, lustrous and prosperous water body. This vast, alive and thriving water body was considered as the pride of the city for its limpid, crystal clear waters, without contamination and effluents, used as portable water by the locals both for drinking and other domestic purposes. This healthy and flourishing lake was famous for its scenic beauty, cool breeze and picturesque. Lake products were delicious, so tasty and mouthwatering. Fish, Nadru and other lake products were produced in huge quantity. Boats, Shikaras and house boats were present. People both young and adult bathed and swam in the lake for the whole day both in summer and in winter. There used to be great activities in this lake like what we see in present days in the famous Dal Lake. Zadibal Nadru, was highly preferred by the locals. Besides fish and fodder along with other lake products were palatable. The lake was deep and pellucid with no sign of eutrophication or excess weeds. Population surrounding the lake was meager. Khushal Sar is a neglected lake without any supervision by the government, neither there is any authority that owns it. It is under the supervision of SMC along with Anchar Lake and Gill Sar Lake. They are totally ignorant about the methods of conservation and maintenance of these water bodies. A short drive from Srinagar takes you to Manasbal Lake Approx 30 Kms from Srinagar city. Manasbal Lake which at first view looks carpeted with lotus flowers. It is also where birds chirping is probably the only sound you’ll hear. Manasbal Lake is a favourite haunt for photographers who throng the area for shots of the aquatic birds of Kashmir.